One of the core requirements of flexible production is the ability to quickly install machines and modules, reconfigure them at will and operate them without disruption. With its Han® ES Press HMC series, HARTING has developed suitable interfaces that can be installed quickly without tools and are extremely robust – meaning they can handle at least ten thousand mating cycles. The quick connect technology is dubbed the Han ES Press HMC, with the suffix ‘HMC’ standing for High Mating Cycles. The contact inserts are equipped with a pre-tensioned cage clamp which is triggered by an actuator. If the actuator is pushed into the contact chamber, the cage clamp returns to its original position and secures the conductor end. To release the connection, a screwdriver need merely be pushed into the actuator and the lever moved to the transition to the insulating body. The spring then once again releases the end of the conductor – e.g. for de-installation or when replacing components. Optimised for fast assembly in the field as well as for thousands of mating cycles – the Han® ES Press HMC connector. The suitability of the Han® ES Press for high mating cycles has been achieved by fitting the contact inserts in Han® standard housing sizes 6 B to 24 B. The standard housings are already available in versions with locks and seals optimised for high mating cycles. Complementing this, contacts and grounding elements are now used that are extremely resistant to abrasion due to a special surface coating. The Han® ES Press series’ advantage is its ability to withstand vibrations well. This is due to how tight the conductor sits as a result of the constant pressure of the cage clamp. Installation and connection times are reduced when compared to conventional cage clamps, screw connections or hard wiring techniques. On-site installation time is reduced, and fast detachability facilitates servicing. The Han® ES Press HMC is particularly suitable for measuring and testing technology which is often hooked up to changing sources of supply. Typical applications would include portable machinery and devices powered by electrical conductors. 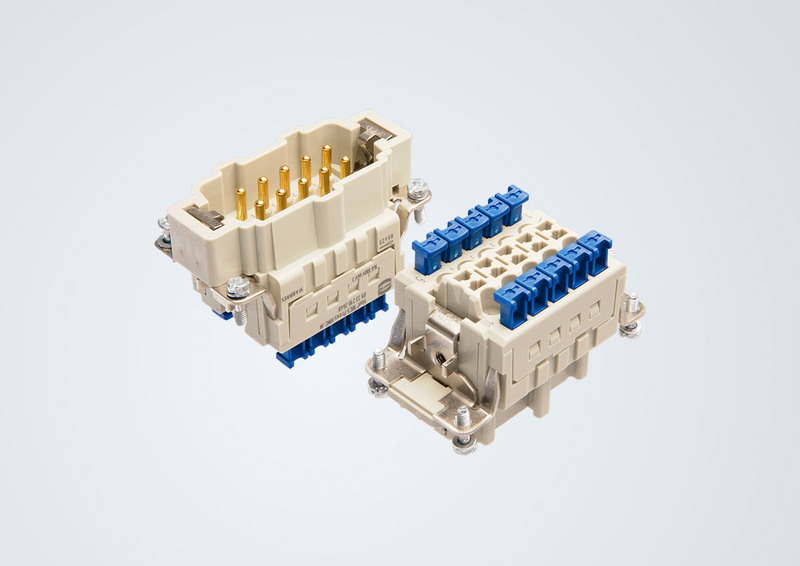 The use of HMC connectors is also worthwhile for machines and systems where frequent reconfigurations and tool changes take place. Han® ES Press HMC ensures that users can design their machine inventory in future-proof manner for further modularisation. Connectors capable of handling thousands of mating cycles are a sensible solution for devices and machines on test stands. Learn more about Han® ES Press.